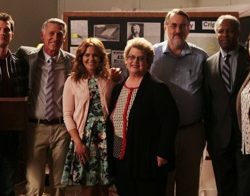 Behind-the-scenes photos from Charlaine’s guest appearance on The Julius House: An Aurora Teagarden Mystery (forthcoming on the Hallmark Channel). 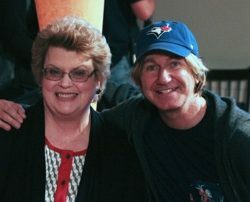 Charlaine Harris (in make-up for her scene) with producer Jim Head. Scott Lyster (Perry), Bruce Dawson (John Queensland), Candice Cameron Bure (Aurora), Charlaine (Charlaine), Charlaine’s husband Hal, Julian Christopher (LeMaster), and Lexa Doig (Sally).